I hope your week is going well. I am feeling super inspired after half term, as I made my second to Paris this year! This time I went with the children and my parents. Once I’ve edited my photos I’ll write about what we got up to. Today I wanted to share with you some images that I took for my Reclaim Magazine feature at the beginning of the year. This feature was inspired by fairytales, so I took decorative inspiration from some of my favourite childhood stories, and styled four looks based on those narratives. It was fun to use my imagination and try something little different! As a child I absolute loved the illustrated book I had of this tale, with the beautiful patterned mattresses piled high on a four poster bed. I made my own Princess bed by piling high my collection of vintage eiderdowns. They look so delicious all piled up like that. 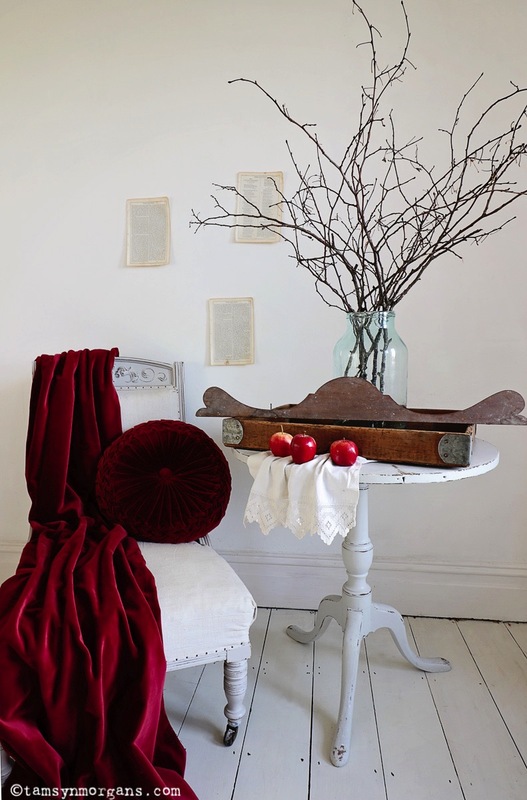 I was always afraid of the Big Bad Wolf, but I did love the deep red velvet cloak that Red Riding Hood wore, and red apples add another pop of scarlet. Mix rustic wood with lace and velvet, and forage in hedgerows for nature treasures which can be displayed in glass jars. I loved styling this look. the brief for that issue was to include natural wood where possible, so included that element with the wreath and the foraged twigs. There’s something so magical about swans don’t you think? I have a bit of a thing for these vintage planters which I found at a local charity shop a few years ago. I used an old sequinned dress as the glistening water, and of course fairy lights for extra sparkle. Use a little imagination, and you too can create a scene straight out of a fairy tale using textiles, colour and texture. For more fairytale photographs, you can see my Red Riding Hood snow portraits I took with my daughter here. Which fairytale is your favourite?